Built with the same high end components you find in all CH Products, the CH Eclipse brings value added functions to compliment all your favorite sims. Review: Very good quality and materials, sturdy and ergonomic. The yoke and its axis came perfectly calibrated out of the box. It feels really comfortable and is very easy to use. Configuration does not need any auxiliary software. I used it with FlightGear in Linux and X-Plane in Win7, in both cases no driver is needed to configure and calibrate and works as expected. Very good product, if you cannot buy pedals or a quadrant you can do only with this piece of hardware. Review: I have owned the basic CH Yoke previously and never had a problem with the unit. I just purchased the Eclipse version and so far just as satisfied with the unit. The Eclipse has additional features (buttons, toggles) to provide more Sim flexibility. This is not a high end precision instrument but for the $$$ it does the job. Everything you need for your first yoke. Pros: Great first yoke!!! Quality parts, easy setup, integrated throttle quadrant, thumb-paddle rudder pedals, gets you fully equipped for simulated flight!!!!! Review: I bought this as my first yoke. I liked the fact that it has an all-in-one solution - there is a complete single-engine throttle quadrant and thumb controlled rudder pedals that offset each other like real ones. There are also switches and buttons (two buttons on the front of the yoke, and two switches on the console) for your radio, AP, landing gear, flaps or whatever you might need. As far as i can tell the knob in the center of the yoke which switches on a yellow, green or red LED, moving left to right, is just for show. I cant find a way to assign that knob to any sim functions. The yoke just works with X-Plane 11, truly plug and play with all functions intelligently automapped by Laminar. Centering and resolution are great. No noise, no matter, auto-centering feels very natural and I now have pinpoint control of my aircraft even when all the stability aid in the sim is turned off. Review: Biggest criticism of online reviews was spring was to tight. I would agree with this criticism. It would be nice if there were a way to reduce the tension on the spring especially when landing. Plenty of buttons to customize and otherwise works as I expected. It would be nice if the controls for the flaps and landing gear were higher on the unit. Current location is hard to get at. Setup can also be a little difficult when dealing with the throttle, yoke and rudders at the same time. Review: Springs are too strong.centering needs work other than that is ok.
Review: This item met all my expectations with one exception. I thought it was preprogramed to function with FSX as shipped. The fuel mixture and prop controls are not plug and play. Cons: The spring inside gets a little creaky when turning left, and sometimes I hear a metallic springy "popping" sound when turning left occasionally. It is only a sound though, the yoke feels smooth and I have precise control of the plane at all times. A: Yes, the CH Products Hardware is fully compatible with Microsoft Flight Simulator X.
Q: Is it compatible with flight sim 2004? A: Yes, you can use this yoke with X-Plane. In order to make it run on a Mac, you may need something called InputSprocket which you can find information on by searching for it on Google. Q: Does it come with CMS software? Q: Is the CH Products Eclipse Yoke,(200-616) compatible with Windows 7 (64 bit)? A: Yes, it is compatible with all versions of Windows 7. Q: What is the "CMS" software you refer to regarding Mac users?? (I hate it when people use abbreviations and they assume you know what they are talking about). Q: What is the difference between the 200-615 and the 200-616? A: Some major difference between the Flight Sim Yoke (200-615) and the new CH Eclipse Yoke (200-616) are listed below. 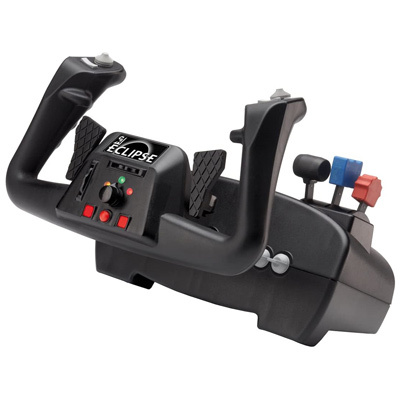 A: Yes, the rudder pedals are used for rudder control in flight simulation software. Q: will this work on my macbook pro? A: This is compatible with Windows 98, ME, 2000, XP and Vista (32 and 64bit) and Mac OSX and earlier. However, the CMS programming software is NOT compatible with Macintosh. A: Yes, they will work together great. Complete your virtual pilot’s controller setup and take flight simulation reality to the next level. These responsive pedals deliver a smooth, highly realistic flying experience.